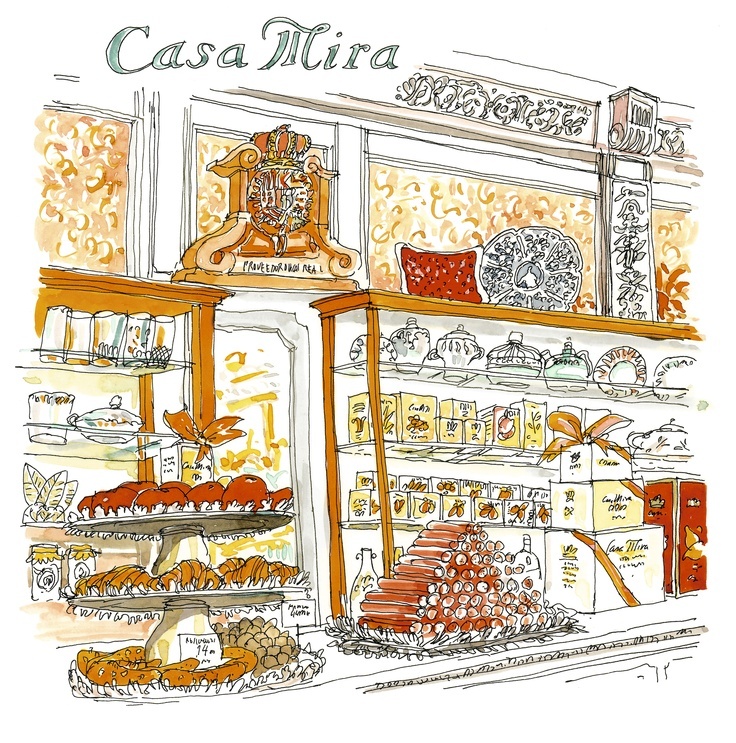 ​Located on the Carrera San Jerónimo, between the Puerta del Sol and the Paseo del Prado, Casa Mira was founded in 1842 by the intrepid Luis Mira. Originally from the town of Jijona in Alicante, Luis would set out for Madrid around Christmas to sell his turrones in the Plaza Mayor. Unfortunately, he would never make it that far as his products would sell out along the way. 172 years later, this historic store has remained pretty much unchanged. The Spanish Royal Warrant, granted by Queen Isabel II, hangs above old glass cases filled with the traditional handmade nougat (turrón) and candies this charming shop is famous for. This rectangular shop is lined with shoulder-level wood and glass cases that follow the lines of the burgundy brocade-covered walls. On the back wall, a solemn portrait of Luis Mira keeps watch over the daily comings and goings. It’s a tidy place that resoundingly echoes the last century. 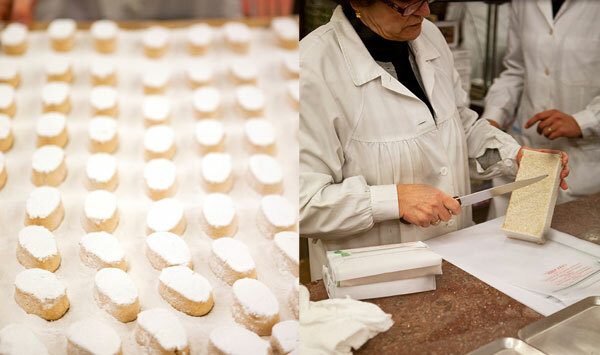 While these confections are traditionally for Christmas, most of the varieties are available here year-round. The turrones are sold by weight. Sweet made from toasted almonds with a sugar coating 100% handmade, premium quality, no additives, no preservatives elaborated by Casa Mira since 1842. Oval in shape with a smooth polished white surface from the sugar coating which covers it. Mainly sweet flavor and crunchy texture. 100% handmade, premium quality, no additives, no preservatives elaborated by Casa Mira since 1842. Oranges, tangerines, peaches, pears, pineapple and watermelon. ​The master baker Luis Mira, who came to Madrid from Jijona (Alicante) at middle XIX century, opened this store which is still famed today for its traditionally made candies and nougats. Typical Christmas sweet cake made with flour, lard, sugar, cinnamon and sesame, and baked in the oven. 100% handmade, premium quality, no additives, no preservatives, elaborated by Casa Mira since 1842. Here polvorones are hand-wrapping with red, white and blue squares of paper. Freshly laid out on the old wooden counter, this simple gesture captured the age-old tradition of these typical Spanish Christmas treats. Chestnuts candied in sugar syrup and glazed. 100% handmade, premium quality, no additives, no preservatives elaborated by Casa Mira since 1842. Individually wrapped in a special role for this type of candy. 100% handmade, supreme quality, no additives, no preservatives, elaborated by Casa Mira since 1842. The master baker Luis Mira, who came to Madrid from Jijona (Alicante) at middle XIX Century, opened this store which is still famed today for its traditionally made candies and turrón (Spanish nougat). Candied Tangerines 100% handmade, supreme quality, no additives, no preservatives elaborated by Casa Mira since 1842. The master baker Luis Mira, who came to Madrid from Jijona (Alicante) at middle XIX Century, opened this store, which is still famed today for its traditionally made candies and turrón (Spanish nougat). Large marzipan sweet (made with almonds and sugar), filled with pieces of candied fruit and crystallized pumpkin formed into a special shape resembling a chest. 100% handmade, premium quality, no additives, no preservatives, elaborated by Casa Mira. Founded in 1842 by Luis Mira, this historic store has remained pretty much unchanged. The Spanish Royal Warrant, granted by Queen Isabel II, hangs above old glass cases filled with the traditional handmade nougat (turrón) and candies this charming shop is famous for. A soft confectionery made by cooking sugar and honey, adding and kneading in roasted hazelnuts and egg white. Marzipan and egg yolk wrapped in icing sugar and handrolled. Sweet with a shiny dark brown color, handmade by Casa Mira with toasted almonds pressed into a medium-sized tablet, with melted sugar. It has a flavor of mild caramel and toasted almonds, with aniseed notes. The color is an almost transparent brown and shiny. The texture is hard due to the solidified sugar. Sweet made from toasted pinenuts with a sugar coating 100% handmade, premium quality, no additives, no preservatives elaborated by Casa Mira since 1842. Delicious sweets made with whole walnuts and egg yolks. 'Imperiales' Stuffed Almonds with Jijona nougat with almond shaped, coated wafer. Candied Oranges 100% handmade, supreme quality, no additives, no preservatives elaborated by Casa Mira since 1842. The master baker Luis Mira, who came to Madrid from Jijona (Alicante) at middle XIX century, opened this store, which is still famed today for its traditionally made candies and turrones (Spanish nougat). Candied Pears 100% handmade, premium quality, no additives, no preservatives elaborated by Casa Mira. Candied Cherries 100% handmade, premium quality, no additives, no preservatives elaborated by Casa Mira since 1842. The master baker Luis Mira, who came to Madrid from Jijona (Alicante) at middle 19th century, opened this store which is still famed today for its traditionally made candies and turrones. The master baker Luis Mira, who came to Madrid from Jijona (Alicante) at middle XIX century, opened this store which is still famed today for its traditionally made candies and nougats. Candied Watermelon 100% handmade, premium quality, no additives, no preservatives elaborated by Casa Mira since 1842. 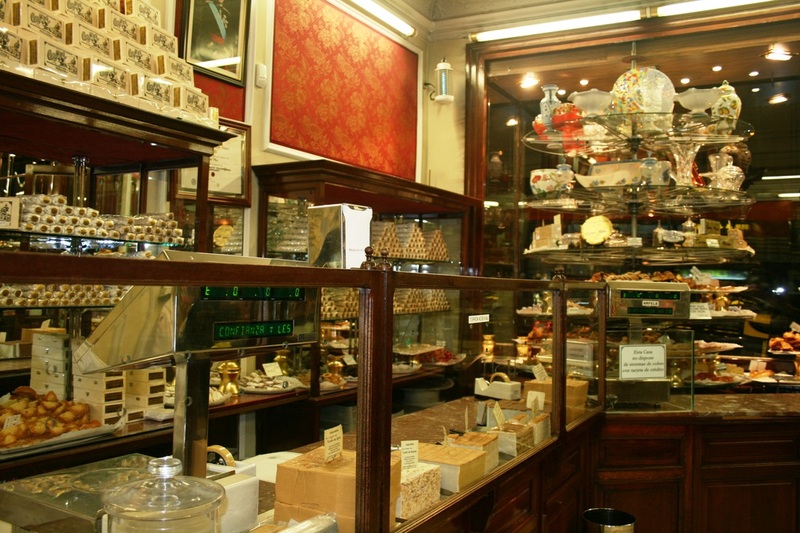 The shop’s most striking feature is perhaps the row of turrones lined-up behind a glass case. The most popular are the two most classic varieties: Jijona and Alicante. Jijona is soft and yielding, made with finely chopped almonds, honey, sugar and egg whites. It’s also the only one not made on the premises, due to the fact that it is protected by a Geographic Protection Indication. Despite the fact that it can only be made in Jijona, Mira family takes pains to protect their top-secret recipe. ​The variety known as Alicante is a hard, white turrón with a consistency similar to peanut brittle. It’s made with honey, sugar, egg whites, coarsely chopped almonds and oblea, a thin white wafer made from flour and water. Other varieties include: hazelnut, yema (egg yolk), guirlache (almond brittle), marzipan, fruit and Cádiz. They are made using all natural ingredients, following the original recipes. ​​There's a beautiful variety of whole, candied fruits like cherries, pears, apricots, peaches, plums, tangerines and oranges. Other seasonal treats include walnut egg yolk sweets, candied almonds, pinenuts and marzipan. All the products are handmade using the finest ingredients in the old-fashioned way with no preservatives or artificial colourings. This establishment is also known for being a supplier to the Royal Household.